The Chatham Anglers (6-4-2) had their three-game unbeaten run snapped in game one of Sunday’s doubleheader versus Cotuit with a 6-1 loss. In game two, just one-and-a-half innings elapsed before fog took over Veterans Field for the second time in four games, forcing a postponement. The contest is set to be made up in July. With two of Chatham’s top players leaving for Team USA, a new group of players coming to town and the fog and rain cancellations, it is difficult to pinpoint what the future holds for the A’s. Here’s some insight on such topics from beat writers David Schneidman and Peter Warren. How will the departures of Spencer Torkelson and Cody Bradford to Team USA impact the team? David Schneidman: Torkelson’s value stretches beyond his home run and RBI numbers. The rising sophomore has more plate appearances (50) than any other Chatham player. Greg Jones (UNC Wilmington) is the only other Anglers player to start all 12 games this summer. Torkelson’s departure will open a spot in Chatham’s starting lineup, giving outfielders Adam Fogel (Hawaii) and Colin Simpson (Oklahoma State) an opportunity to occupy the vacancy in right field. 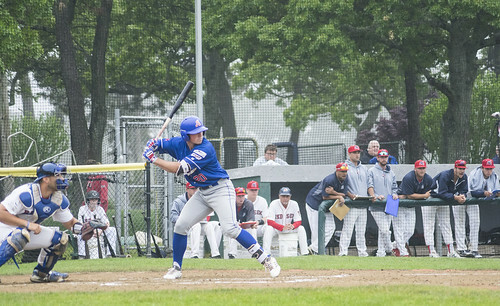 Spencer Torkelson, who leads Chatham with five home runs, will depart for Team USA on Monday. Torkelson leads the A’s in the following offensive categories: home runs, RBI, slugging percentage, on-base percentage and hit-by-pitches. Once he leaves, there is no player on A’s manager Tom Holliday’s roster that can replicate Torkelson’s numbers. The Anglers’ only hope is for the contributions of several players, including soon-to-be newcomers Nick Kahle (Washington) and Michael Busch (North Carolina), to try and equal what Torkelson has done. Peter Warren: Bradford — the Big 12 Pitcher of the Year — kept his great spring rolling into the summer with a stellar two-hit, six-strikeout performance in his first start on June 14. While he struggled in his second outing Thursday, Bradford still showed the skills that made him desirable to Team USA in the first place. There are plenty of pitchers who can fill the “ace” role Bradford was expected to fill for the summer. Alek Manoah (West Virginia) has been really solid in two starts. In the “second starter” role Holliday has utilized in most games, Dan Hammer (Pittsburgh) and Hunter Gaddis (Georgia State) have been lights-out. That is not to say Bradford will not be missed. The cerebral left-hander had the potential to be a Cape League All-Star and Chatham would have been favorites to win every time his Nike cleats straddled the rubber. If he does come back after completing his time with Team USA, it would be a real big boost to Chatham’s staff for the stretch run of the season. When will the full roster finally be on the Cape? DS: The Anglers have five players set to join the team in the coming week — Kahle, pitcher Austin Bergner (UNC), infielder Ashton McGee (UNC), pitcher John McMillon (Texas Tech) and infielder Rankin Woley (Chattahoochee Valley). Busch’s arrival date is undecided, Holliday said, as the utility man is set to undergo an MRI after running into a wall during the College World Series in Omaha. The arrival of the new flock of players could solidify infield positions that have been occupied by a rotation of players so far this season. Woley, who led all junior college players in batting average (.460), hits (93) and games (60) during the spring, spent his sophomore year in Phenix City, Alabama after batting .267 in 26 appearances for LSU in 2017. The rising junior, who can play multiple infield positions, will play at Auburn in the fall. PW: In addition to these new additions coming soon, Bradford and Torkelson both said they would like to return to Chatham after their time with Team USA ends. The last scheduled event for Team USA is July 15. Holliday said Torkelson is looking to be back on July 17 so around then is when to expect to see their faces again. Also, Chatham could pick up some more players later in the season. In four of the last five years, the Anglers have activated a player in August. Much like in the MLB, the rosters will always be in flux, but the majority of Chatham’s roster is already on the Cape’s elbow. The Anglers are scheduled to play 15 games in 15 days in July. How will that impact the team? DS: Each of Chatham’s post-off day performances have been sluggish, Holliday said. In the two games, at Wareham on June 19 and Sunday against Cotuit, the A’s have been slow out of the gate. They failed to score in the opening five innings on both occasions, the only two times that has happened in 12 games this summer. Such tendencies make the upcoming stretch of games, while physically tolling, desirable for the Anglers. The constant weather interruptions in the past week, including two fogged-out games and one rain-out, throw off the everyday routines of the players. The result has been a lack of consistency, Holliday said. “I just sometimes get the sense guys coming to the yard in a different way from one day to the next,” Holliday said. PW: While only seven of the 15 games will be played in the friendly confines of Veterans Field, most of the away games will be played close to Chatham. Two of the away games will be played in Orleans and two will be played in Harwich. The farthest Chatham will have to travel will be to Falmouth twice, but the team avoids heading out to Bourne, Cotuit, and Wareham during that span is a major plus. The biggest thing Holliday will have to manage is the pitching staff. Chatham has plenty of arms available and Holliday has done a great job rotating the pitchers and keeping them on a set schedule. However, if one game goes into extra innings or a few pitchers struggle in an outing, the rotation may be thrown off and force Holliday to make some moves in the rotation. But, if the staff continues to pitch as well as it has, this will not be a major concern.